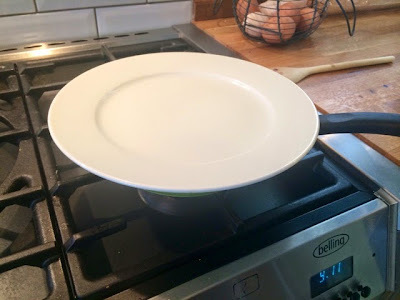 The kind people at Moderna Housewares recently sent me their Ozeri Green Earth Frying Pan to use and review so I thought, what better test for a frying pan than breakfast! 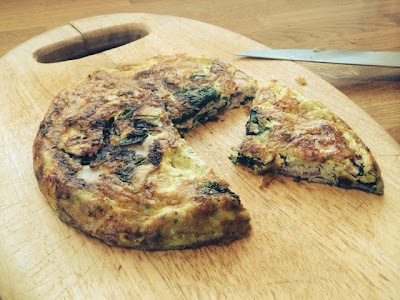 I fancied something a little more substantial than an ordinary omelette and so opted for a frittata for this test. A frittata is basically a chunkier omelette, similar to a tortilla but doesn’t have potatoes. It makes a great breakfast to share with the family. 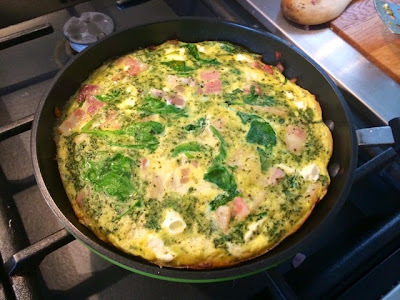 This 30cm pan made a small frittata that The Boyfriend and I greedily shared between us, but would easily be split between four served up with some toast. The first thing I liked about the Ozeri frying pan is the colour. I’m a sucker for brightly coloured kitchen ware, it’s just more fun. 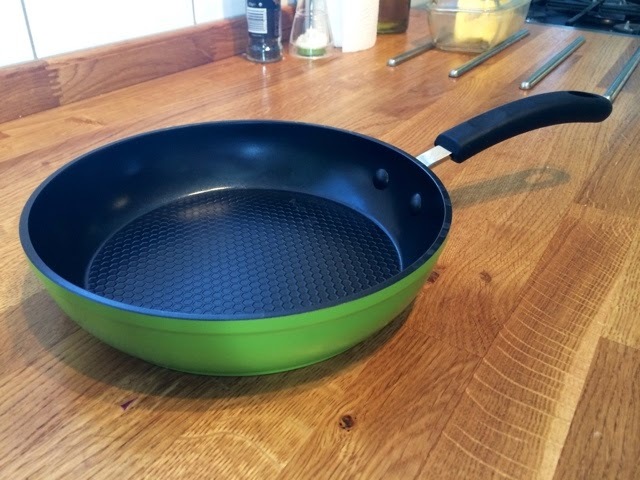 The pan feels really substantial to hold without being too heavy to carry anywhere, the silicon handle is comfortable and doesn’t heat up allowing you to safely pick up and manoeuvre the pan around your kitchen while it’s still hot. The Ozeri pan is green in more ways than one. The GREBLON ceramic technology used in the pan coating provides a non stick surface without releasing harmful toxins when it reaches a high temperature, a concern with some non-stick coatings. 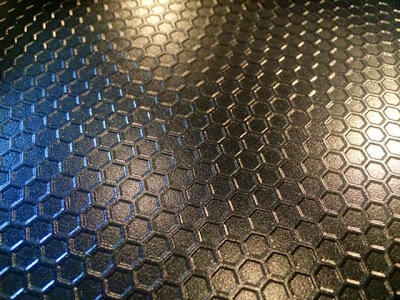 The base of the pan isn’t just decorated with a pretty pattern, the design aids temperature distribution ensuring an even cooking temperature across its surface. You can see below the surface of the pan both before and after use. My frittata didn’t stick to the pan at all and the non-stick coating also means the pan is so easy to clean afterwards. 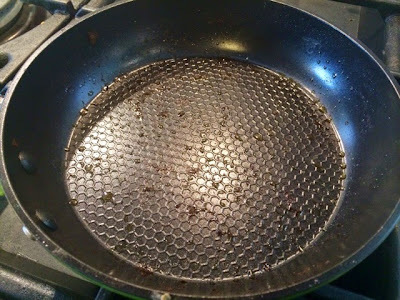 As you can there is barely anything left behind in the pan, no sticky residues, nothing that needs scraping off, just a few splatters of leftover oil, it’s practically wipe-clean. The scratch resistant surface also means that the coating won’t be scrubbed off by a wire brush. 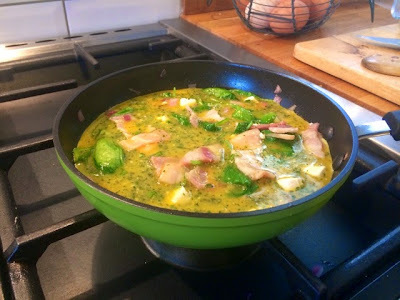 The Ozeri Green Earth Frying Pan has made a bright, colourful and super efficient addition to my kitchen cupboards. 1. 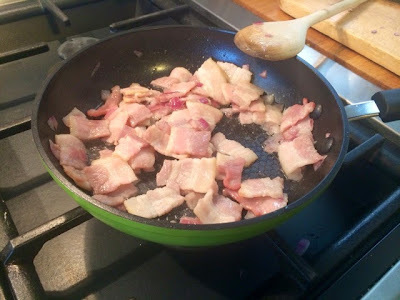 Heat a little oil in a frying pan and throw in the bacon and onion. Fry until onions are softened and bacon is mostly cooked. 2. 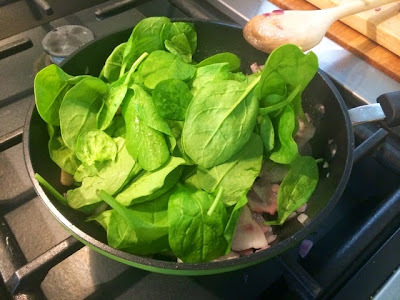 Add the spinach and allow to wilt. 3. 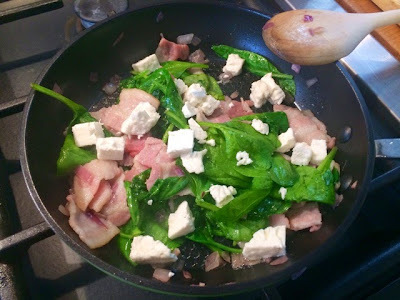 Throw in the feta and mix ingredients up to ensure they’re evenly spread around the pan. 4. Beat the eggs together with the pesto, fresh herbs and season with salt and pepper. 6. 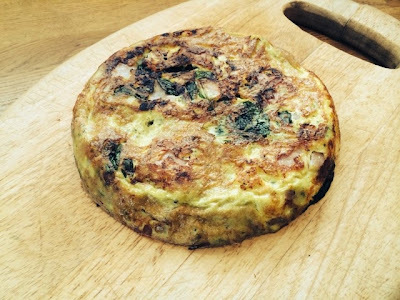 The frittata should take about 10 minutes to cook completely through. 7. Flip out upside down onto a board and serve.